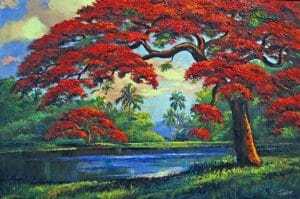 The Florida Highwaymen Artists were the beginning of Florida's contemporary art tradition, and are credited for the beginning of the "Indian River School" art movement. They developed their own individual techniques and captured waterscapes, backcountry marshes, and inlets the way they were before recent tourism developments. From the beginning, there were people who collected Florida Highwayman art and paintings. However only in recent years has the recognition of their skill and their story caused their paintings to skyrocket in value. In 2004, twenty-six individuals were inducted into the Florida Artists Hall of Fame as "Florida Highwaymen."